The new bath: fixing it into position. New bath fixing - Installing the new bath. At the right I have slipped the new bath into position and it is just sat on top of the two hardwood timbers seen in the previous page. I have my level on the top testing it for level. The top of the bath perimeter is set level. The manufacturer makes a fall to bottom of the bath to the outlet. That is already built in, don't worry about fall, get the top level! I was lucky in that I could get a new bath with an identical layout so that my new outlet fit nicely into the existing waste pipe. So after testing the bath for level when it was sitting nicely on the timber, I pulled it out and got the waste ready. The chrome outlet to the bath has a rubber type washer underneath to form a seal, so that was fixed permanently. The PCV coupling was fixed to the metal fitting with a short length of PVC pipe fixed to it just the right length to fit into the waste socket in the floor. I did a dry test by putting the bath back in place to see that the joint was just the right length. I did a good clean of the PVC waste pipe joint, and the one on the bath with a clean rag and PVC primer/cleaner. New bath fixing - Set up in the correct position. 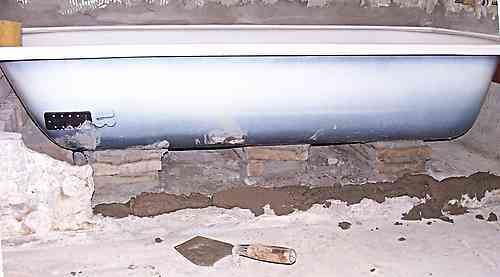 The trowel in front of the bath is an old brickies trowel that has had the point cut off, just right for getting the mud out of the buckets. Here's the new bath set into position. The recess in the walls to the bath has been plastered up with sand and cement mortar. The bath has three large pads of support under it. Usually I just use a very dry stiff mix of mortar to pack up under baths like this, but I had some 50 thick cement pavers handy so I used them with mortar joints to save making up a lot of mortar. This is to give the bath a nice solid feel. When baths are just sitting on the outer rim they feel and sound hollow. The bath manufacturer's blurb says to support around the perimeter, with no mention of underneath support, I have never seen a bath put in without support underneath. In this photo I have just laid a bed of mortar to start bricking up the front of the bath. The trowel I have laid it with in the foreground is a brickies trowel that has the pointy end cut off with a grinder. This makes a nice tool for mixing and getting mortar and tile adhesive out of mixing buckets. When laying out the wall I allowed 10mm for plaster, 8mm for the tile and and another 3mm or so for clearance, between the face of the wall and the inside rim of the bath that the tiles had to tuck in behind. This meant that I was OK to lay 400 x 100 x 100wide cement blocks to start of with, and then I had to cut some of them narrower at the top where the bath curved out. This worked out fine, with the tiles fitting up under the rim nicely. I sealed the joint afterwards with white silicon, but that was just for cosmetic reasons as the bath rim overlapped the tiles by 20mm or so.